by Naomi Yavneh Klos, Ph.D.
Madison’s comment is remarkable, however, not just for its seemingly anachronistic terminology, but also because of its subject. 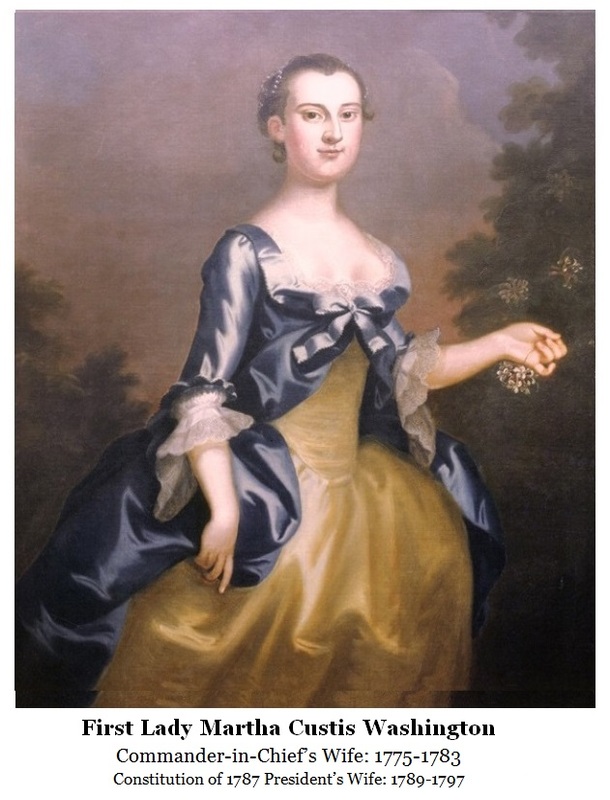 Martha Washington is, after all, universally recognized as the United States’ first First Lady – whether or not that term was in use at the time. To whom is Madison referring? Throughout American history, the First Lady has played an important role in hospitality. She serves and has served as hostess, adviser and, often, social activist – even before the Constitution of 1787. In 1776, George Washington served as the Commander-in-Chief of the Continental Army but he was not the President of the United States; John Hancock was the elected President of the Continental Congress and in that position he signed the Declaration of Independence. As President, Mr. Hancock was considered the new nation’s Head of State. The Commander-in-Chief’s wife, Martha Washington, and the Continental Congress President’s wife, Dorothy Hancock, each took on the responsibilities of providing hospitality to important figures of the day. In addition to hospitality, the First Ladies supported their husbands by helping them carry out many tasks. 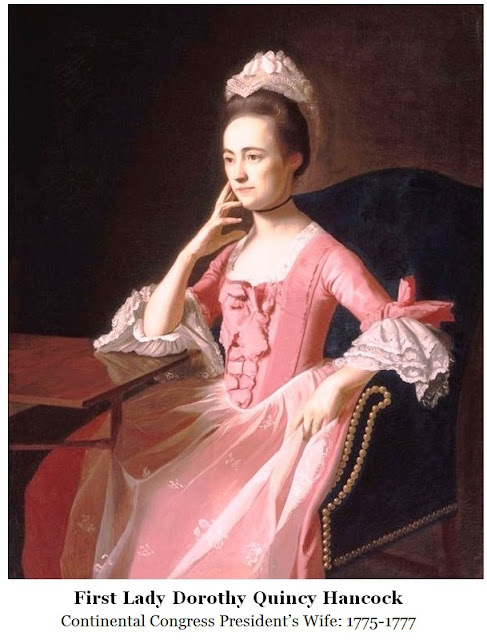 For example, Martha Washington was very concerned with the morale of the troops, and worked with women in many cities to collect funds and make shirts for soldiers. She stayed with her husband in camp, cared for sick soldiers and helped organize dances and dinner parties, frequently at the commander-in-chief’s headquarters. Two Pair of Colours belonging to the Seventh Regiment, were brought here last night from Chambly, and hung up in Mrs. Hancocks Chamber with great Splendor and Elegance. That Lady sends her Compliments and good Wishes. Among an hundred Men, almost at this House she lives and behaves with Modesty, Decency, Dignity and Discretion I assure you. Her Behaviour is easy and genteel. She avoids talking upon Politicks. In large and mixed Companies she is totally silent, as a Lady ought to be—but whether her Eyes are so penetrating and her Attention so quick, to the Words, Looks, Gestures, sentiments &c. of the Company, as yours would be, saucy as you are this Way, I wont say. But the President of the Continental Congress served a year or less. And this tradition became codified under the Articles of Confederation, which not only further limited the president’s congressional powers, it specified a one-year term, with no possibility of re-election. Although the role of the President of both the Continental Congress (1774-1781) and the United States in Congress Assembled (1781-1788) was vastly different than the role under our current constitution, hospitality was an expected part of the job. Indeed, beginning under the Presidency of John Jay (1778-79), the president received the use of a “convenient dwelling house,” along with “a table, carriage and servants” at public expense, and a $3000 entertainment stipend. 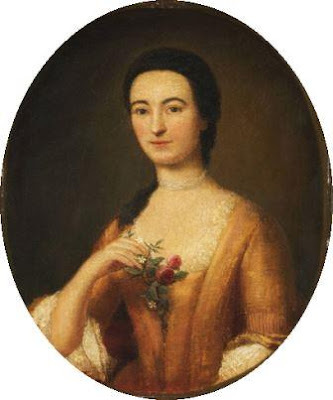 Sarah Livingston Jay was not able to join her husband until several months into his presidency, but, upon her arrival in Philadelphia, she both hosted and attended dinners that included such dignitaries as the Ministers of France and Spain. 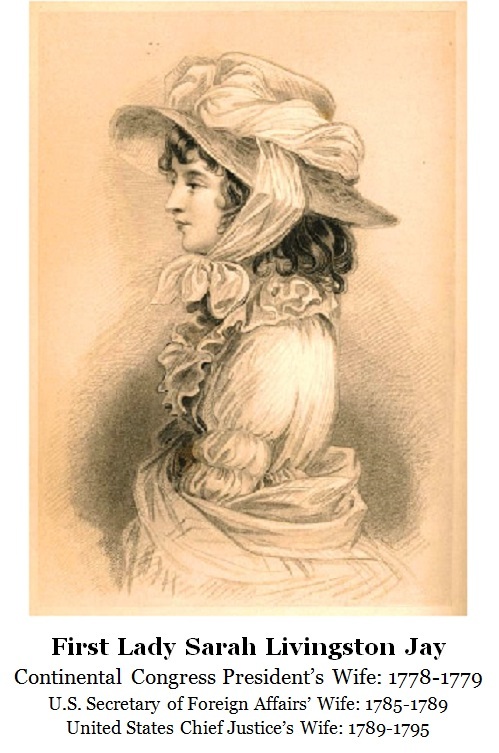 The development of those relationships played an important role in both the selection of John to serve as Minister Plenipotentiary to negotiate Peace with Spain, and Sarah’s decision to leave their son, Peter, with their parents and join her husband for several years of diplomacy in Europe. To crown our Hero on Virginia's plain. The President of Congress gives a dinner one or two or more days every week, to twenty person, gentlemen and ladies. Mr. Jay, I believe, gives a dinner almost ever week: besides the corps diplomatique on Tuesday evenings, Miss Van Berkell and Lady Temple see company; on Thursdays, Mrs. Jay and Mrs. Laforey, the wife of the French Consul, on Fridays; Lady Christiana, the Presidentess; and on Saturdays, Mrs. Secretary ---. Papa knows her, and to be sure, she is a curiosity. (September 7, 1788). 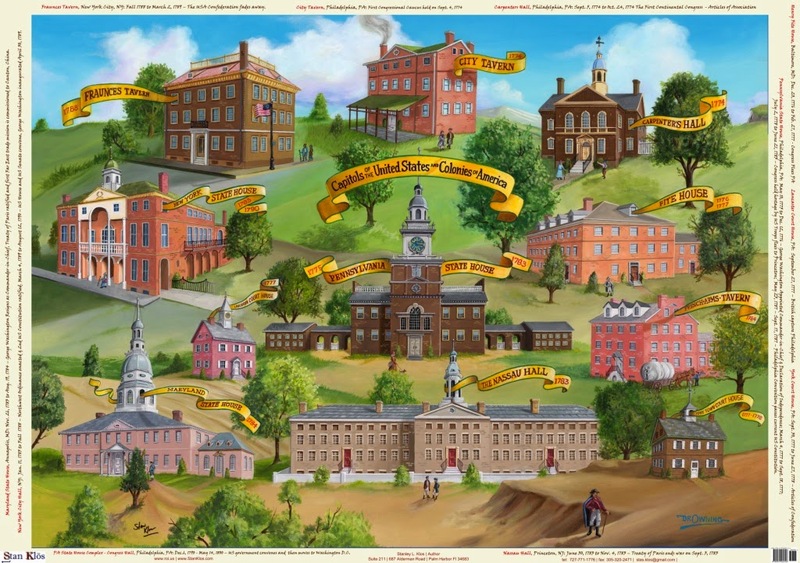 *The Articles of Confederation limited the term of each USCA President to one year. Consequently, each President remained in office until the one year term expiration, unless the USCA President resigned or another Delegate was elected in his place.